This can help reduce or remove horizontal lines on the screen of a cctv camera. These lines may be stationary or moving up and down the screen. The ground loop isolator has a BNC male to BNC female input / output. This video product is passive, which means it does not require power. The idea behind the SP-G01 is that it prevents video signal distortion caused by video ground loops. Video ground loop isolators are passive devices which reduce ground loop interference with CCTV signals and can easily be installed in a new system or added to existing CCTV camera systems. These devices are useful where a video signal is transmitted via coaxial cable between points with different ground potentials. Differences in ground potentials are typically caused by unbalanced power line loads. 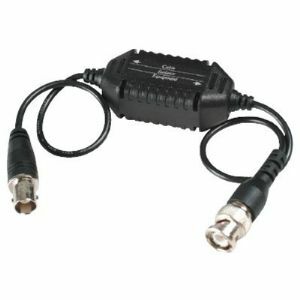 The cctv video ground loop isolator is installed in line with the video cable that has come directly from the CCTV camera and before the coax cable is connected to any other device. If several security cameras come from the same area, it is recommended to install a ground loop isolator in line with every cable.